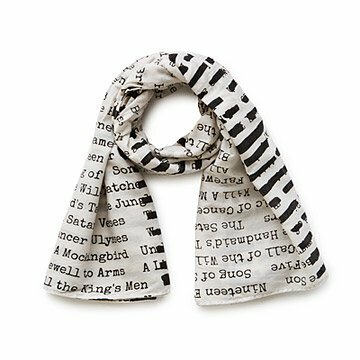 Take a stand for unfettered speech with this bold scarf printed with once-censored titles. The Great Gatsby, Lord of the Flies, Of Mice and Men, To Kill a Mockingbird—they all might be well-loved classics, but they have something else in common: they were all banned at one point. Use fashion to take a stand for freedom of expression with this bold, hand-printed scarf on which notable offenders are artfully censored. Made of a soft blend of 80% cotton and 20% silk in India. This scarf is gorgeous, lightweight and thin and rectangular, so you can wear it as a shawl or a neck scarf. Background color is true ivory, not too yellow. And the censorship blackouts give the design real punch. My sister runs an indie bookstore and sometimes she's hard to shop for, but this was perfect! She absolutely loves it! It was fun watching her open it and then realizing just what it is!